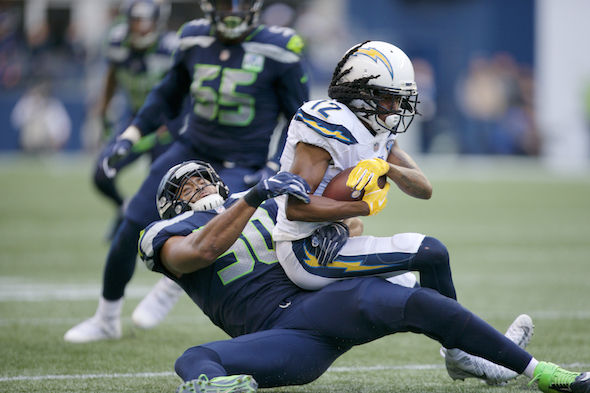 Against the top offense in the NFL Sunday, the Seahawks’ secondary could start three second-year players and a rookie. The future has arrived. Fans may want to practice cringing. When the Los Angeles Rams last were seen locally Oct. 7, Seahawks LB K.J. Wright watched from the Clink sidelines, recovering from arthroscopic knee surgery. He remembered that things were bad that afternoon, but as often is the case with things like car accidents, the brain, out of self-preservation, obscures many details. Such as 30 first downs and 468 yards of total offense. A reminder was provided by a reporter in the locker room before practice Wednesday. Wright flinched. In the broader landscape of the NFL, the numbers weren’t all that shocking. The 8-1 Rams lead the NFL with 447 yards a game (fifth in passing at 302.8 ypg, first in rushing at 144.3). They are third in scoring at 33.2 points per game. But that game was in Seattle and was against a franchise where defense had been a hallmark. The 468 yards was an affront not unlike finding a neighbor’s trash in the driveway. Then again, in December, the Rams won at the Clink 42-7 with 352 yards and 19 first downs. The trash had been there before. So the Rams’ 33-31 win last month was less of a stunner and more like the latest chapter in the narrative of the NFC West’s reversal of form. It would seem that the chance to restore the natural order has improved with the return of Wright, who will play this third game back Sunday at the Los Angeles Coliseum (1:25 p.m., CBS). But the impact of Wright’s return is diminished by the potential absence of another veteran defender, SS Bradley McDougald, whose sore knee kept him out of the second half of the loss to the Chargers and out of practice Wednesday. McDougald has been the lone dad in a secondary of of youngsters who will be targeted by the Rams and every other team thrilled by the absences of Richard Sherman, Earl Thomas and Kam Chancellor. If McDougald doesn’t play Sunday, the starting secondary will be CBs Shaquill Griffin (23, second year), and Tre Flowers (23, first year), SS Delano Hill (22, second year) and FS Tedric Thompson (23, second year). Together, the quartet has a combined 29 NFL career starts, 18 by Griffin. It would be the first career start for Hill, a third-round pick out of Michigan who took first-team reps in practice last week and filled in for McDougald when the defense shut out the Chargers offense in Sunday’s second half. He had a career-high three tackles. Naturally, Carroll said he’s seen enough to tell him him Hill is ready. “His confidence was there, the speed of reaction was there, everything about him – even his play carried over to special teams as well,” he said. “I think he was very comfortable with what was asked of him. He’s a really talented athlete – fast, strong, he’s a cover guy, he’s a good hitter. That hasn’t always showed up as much as it did so obviously to us (Sunday). What the Seahawks are asking of Hill is to help keep a lid on arguably the best trio of receivers right now in the NFL: Robert Woods (51 catches, 743 yards), Brandin Cooks (41, 757) and Cooper Kupp (35, 527). In the first meeting, Cooks was out, but Kupp and Woods split 10 receptions and combined for 182 yards. The pair, along with RB Todd Gurley out of the backfield, slashed the Seahawks with crossing routes underneath coverage that denied the deep ball. Carroll was eager for a fix. “We have to work with the under coverage better than we did,” he said. “We gave up some stuff that they dumped off and made a lot of yards after the catch. A couple of those were (missed) tackles, but just deployment and stuff. Assigning four kids to the task of curbing the NFL’s top offense at its home might be the most bodacious ask Carroll has made of any unit in his Seattle tenure. Of course, he thought it was cool. “Hill looked good, like a natural out there, communicating, calling stuff out before I was calling stuff out — it was pretty fun,” he said. “Kam said the same thing — he looked good. We gotta brush up on a few things because we have a full load this week. The future always starts somewhere. For the Seahawks, it just so happens to be on the home field of the team with the best offense and best record in the NFL. We don’t need practice cringing. We’ve been cringing ever since the play that can’t be unseen. But on the bright side, at least we are not Raiders fans. You having fun, Marshawn? Haha – good one. I forgot about Lynch, now having to go from being at the top to now being in the lowest of the lows. I feel some empathy. He wanted to do a lot for his hometown before the Raiders abandoned it for Vegas. Careful with the smugness. Seahawks are one torn Wilson ACL from chaos. Oh man, are you going to be in trouble for writing that if it does happen. I can’t imagine that the Seahawks could ever fall into the pit of misery that Oakland is in. Beware of George Argyros and Jeff Smulyan. They may be lurking. Art – No doubt it will be interesting to see these db’s work together this weekend, and of course PC is very pumped up and optimistic, yet given those positions are his specialty, I have to believe he wouldn’t have selected them if he didn’t think they could learn and perform. What I hope is the DL and LB’s put enough pressure on Goff to get him somewhat rattled. Having KJ here is a major step up, and having a few more games under their belt since the first LA game is a help. So, let’ just hope the offfense has their shxx together and can take the pressure off the defense. Remember, the Saints put up 45 on these guys last week, so I’m sure PC and crew have studied the hell out of what the Saints figured out. Time for RW and Shott to prove they can be effective. Thanks for the vid. Brees is Wilson’s hero, so I’m sure he’s paid attention. The Rams defense without Talib and with Peters playing hurt is surprisingly vulnerable. The Seahawks offense has to have its game of the season. Delano Hill is one of those guys that’s just hard to figure . They spent a 3rd round pick on him and we still don’t really know what we have . A 3rd round pick in year 2 or 3 should probably be starting ( unless his name is Russell Wilson , at which point you start him immediately ) . But of course he’s had Kam in front of him , and now McDougald – whom I believe is quietly having a Pro Bowl season . As I commented after the Charger loss , the injuries are a concern moving forward . Davis is solid but he’s no Carson . If we lose Fluker for Joey Hunt … I don’t even wanna think about it . I didn’t even know Hunt could play guard until I saw him out there last Sunday ; he’s never played anything but center in training camp that I’ve read , and there’s been mention that he might not have even made the final 53 as he only plays one position on the line . Asking Thompson to step in for Thomas at free safety was one thing ; adding Hill out there too against this Rams team on the road , with a reduced running game without Carson ? This might one of those games guys where I’m afraid Russell is gonna have to toss it up 40 times just to try and stay in it ; I’m expecting a lot of points put up . Unless special teams does something special or we get some turnovers , ya might wanna watch this one thru split fingers . The only way kids can get experience is for them to get experience. No one is expecting thing one from these guys – they can play it loose, have fun, and show us all how good they are. If not, well, that was what was expected, right? I love low expectations – I seek them on a daily basis. “The kids are alright….” (The Who) Play em! There is also something to be said for playing the youngsters in a tough road game against the Rams, with a more winnable home game coming up the following Thursday against the Packers. Good experience for the kids and allows some gimpy vets to rest up. The Sunday/Thursday turnaround is too brutal to play straight up.